Although it is still relatively new as far as media entities go, BuzzFeed has become one of the leading new-media players, thanks in large part to its command of the social web, an ability to craft viral content and a large fan base among millennials. True to form, the company has created a visually-rich index of facts about its size and reach — numbers which help explain how it was able to raise $50 million in a recent financing round. As a caveat, it’s worth noting that the presentation is clearly designed to be a sales pitch for the company’s native advertising efforts, and so there are no links to or discussion of any of the data used to compile the charts. Most of the figures come courtesy of the site’s Google Analytics data, or from firms like Nielsen and comScore. One of the core principles behind BuzzFeed is that social sharing is more important than search, so it’s no surprise that the main driver of traffic (which is estimated to be about 150 million unique visitors per month) is social — in fact, the company says that its social traffic is five times larger than its search traffic. Although social has grown to become one of the leading sources of traffic to most web content, the advertising industry still hasn’t quite caught up to this development, as shown by a BuzzFeed graph courtesy of eMarketer and Shareaholic — which says that social accounts for 30 percent of referral traffic but only 14 percent of advertising budgets. The other major shift in content consumption is mobile, and according to BuzzFeed the two are interconnected, in the sense that a majority of the site’s social traffic comes from mobile, and its share rates on mobile are twice as high as they are from its desktop users. BuzzFeed said mobile also accounts for a rapidly growing amount of video consumption, including 50 percent of all the video that the site produces, and this is particularly the case among millennial users. As a result of its focus on that market, BuzzFeed says that its reach is larger than several leading TV networks, including Fox, CNN and MTV — and among millennials it is larger still, putting the site ahead of most of the major networks, including NBC. Obviously, BuzzFeed’s statistics are designed to promote its advertising appeal. And as with any form of web measurement, the sources it has chosen have their flaws — Google Analytics has a tendency to over-estimate certain kinds of traffic, while Nielsen and comScore have a tendency to under-estimate other kinds, including traffic from corporate networks (and BuzzFeed founder Jonah Peretti has said one of his secret weapons is the “bored at work” network). Some of the conclusions suggested by the BuzzFeed numbers are also debatable: for example, some media analysts argue that social is not as good as search — even if the raw traffic number is larger — because search is a better indicator of purchasing intent. As for video views, TV insiders would no doubt argue that their viewership is more loyal than someone watching a viral video on their mobile device. Those caveats aside, however, the numbers BuzzFeed is generating are still quite impressive for what is still a relatively young company. Ask anyone in their 20s or 30s with a Facebook page and they’ll likely agree. My personal Facebook news feed is usually filled (by lunch no less) with BuzzFeed content, especially cats on Caturday – who doesn’t love loaf cat? Not to mention people in media posting Buzzfeed content to their work Twitter accounts adds to their street cred. You would think now that BuzzFeed has their own news division, Disney and Viacom would at the very least say stop posting BuzzFeed to your work accounts. But at the same time I think they know its also good for business. Data quibbles aside, the Buzzfeed report is 100% directionally correct. That print ad spend has held as long as it has is probably the most astounding factoid! It’s tough to generate ad revenue from mobile audiences. I wonder what their plans are in that department? Great write up, Matthew. 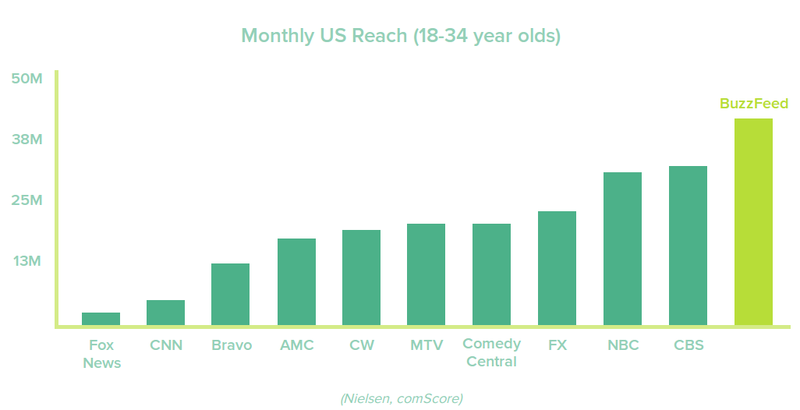 I think this is a hugely important trend that is all about shift of ad $$ away from tv. Millenial + Mobile + Video spells out the doomsday for tv ads. 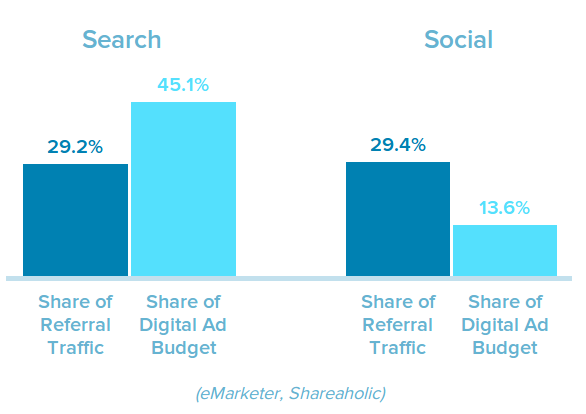 Another interesting thing is that ad $$ aren’t shifting from Search to Social. I think it makes sense because there is no purchase intent on Social, but there is on Search.